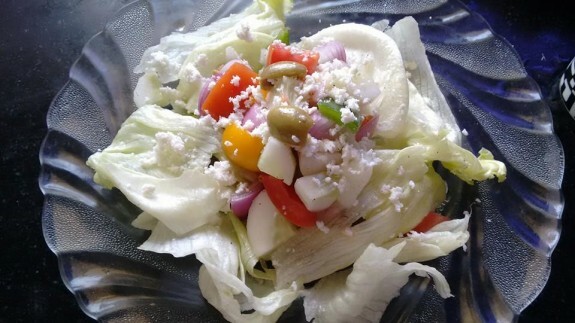 Greek salad with Lettuce leaves is known and lovable around the world. With its lovely herbs and all essential ingredients, the salad will make a great addition on Meal. 1. Take a large bowl and add diced cucumber, tomato, onion, green, yellow, red bell pepper, black and green olives and mix them properly. 2. No add olive oil, lemon juice and mix it well. Sprinkle some salt and black pepper powder and mix everything well. 3. Now add fresh crispy crunchy lettuce and give it a nice gentle stir and toss it well. 4. Serve it in a plate and crumble feta cheese on the top. 5. Your Greek salad is ready to serve. Note: If you give it a little tasty twist, you can add ½ tsp Chaat Masala Powder on the Greek Salad and mix it well.